Assembly를 얼마 앞두고 연녹색의 싱그러운 생명이 들판을 가득 메우던 5월 초입에 아버지께서 본향으로 돌아가셨다. 영원한 삶을 알고 있으면서도 육체의 죽음이 가져다주는 상실감은 나 또한 유한한 생명체임을 다시 깨닫게 해주었고 일종의 무기력감마저 들게 했다. 이렇게 Assembly에 대한 설렘도 기대감도 없이, 오하이오주에 가면 ‘광활한 옥수수밭을 볼까’ 라는 체념 같은 단상을 갖고 떠났다. 그러나 나를 기다리고 있었던 것은 뜻밖의 열정과 기대치 못했던 생명력이었다. 미 전역에서 뿐 아니라 세계 곳곳에서 여러 민족과 인종, 다양한 연령층의 여성들이 5천 명도 넘게 모여들어 그 거대한 컨벤션 센터 안을 열정으로 가득 메우고 있었다. Harriett Jane Olson CEO는 “The power of bold”라는 주제 하에 예수 그리스도의 어머니 마리아를 여러모로 조명하여 주었다. 처녀의 몸으로 아기를 가져야 한다는 청천벽력같은 부르심에, 세상으로부터 쏟아져나올 비난과 정죄, 돌맞아 죽을 수도 있는 위험에도 아랑곳하지 않고 그 하나님의 부르심에 용감하게 따라나선 마리아의 담대한 결단과 용기를 그려나갔다. "우리의 귀를 열어 내 주변 형제 자매들을 통한 주님의 음성을 들어라. 우리의 눈을 열어 내 주변과 세계를 위협하는 현실을 마주 보아라. 감사함으로 마음을 열어라. 주님이 함께하신다. 담대하게 설 준비가 되었는가!" Olson CEO의 연설이 쉼 없이 귓가를 때려왔다. 이러한 느낌은 Assembly 곳곳에서 전해져왔다. 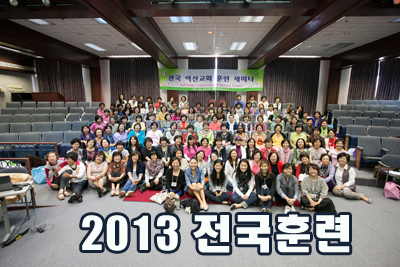 노벨평화상 수상자인 Leymah Gbowee의 간증과 45년 전 Children Defense Fund를 설립해 운영해온 Mariam W. Edelman변호사 등과의 토크쇼 등의 전체 집회와 그 외 작은 규모의 웍샵들, 그리고 그 사이 시간을 통한 여러 사람과의 교제를 통해 여선교회 자체의 살아있는 힘이 느껴졌다. 그렇다. 나는 유한한 생명체지만 여선교회는 영원한 생명체이다. 혼자서는 실패할 수 있어도 함께하면 실패하지 않는다. 공동체로 일할 때 무기력해질 수 없고 그 어떤 일도 부질없는 일은 없을 것이다. Assembly는 나로 하여금 죽음보다 강한 생명을 얻고 돌아오게 해주었다. At the beginning of May, shortly before the Assembly, my father passed away and returned home to Heaven. Even though I know we have eternal life, the feeling of this loss made me realize that I only had a finite life and felt a kind of helplessness. I flew to Ohio without having any excitement or expectations about the Assembly. I Just thought that I would see a vast corn field in Ohio. But it was an unexpected passion and lively vitality that awaited me there. More than 5,000 women of diverse ethnic, racial and age groups gathered around the world as well as around the United States to fill the huge convention center with enthusiasm. Under the theme of "The power of bold," CEO Harriett Jane Olson illuminated Mary, the mother of Jesus Christ, from various angles. CEO Olson described Mary’s bold courage of having a baby in the virgin's body, despite of strong possibility of the cruelty and condemnation that would come from the world. Mary answered “yes” to God even if the call of God was totally unacceptable as a virgin. "Open your ears and listen to the voice of the Lord through our brothers and sisters around us, open your eyes to face the reality that threatens our surroundings and the world, open your hearts with thanksgiving, the Lord is with you. Are you ready to be bold?" CEO Olson’s speech has been resounding in my ears. The topic starting with Mary moved to the United Methodist Women gradually. As dark realities surround us, such as Climate Justice, Economic Inequality, Mass Incarceration, the Criminalization of Communities of Color, and Healthcare, "what are you prepared to sacrifice or commit, just as Mary has made a bold and costly decision?" CEO Olsen asked. 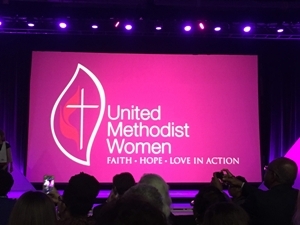 CEO Olson proclaimed that all the United Methodist Women will move forward. It allows us to do things we cannot think of when we work together. It is a time when the United Methodist Women is needed more than ever. We stand in a place where we can change the world. Faith and justice connect the center of our mission. There are the United Methodist women for this purpose. I felt mesmerized by Ms. Olson's bold declaration. I can never be Mary no matter how hard I try, but when I were with the UMW community, it seems that we can achieve greater things than even Mary. It was increasingly obvious that we can do whatever the call of God may be because the Lord is with the UMW. I felt the power of UMW community all around during Assembly; the community gathering with the testimony of Leymah Gbowee, the Nobel Peace Prize winner, and talk shows with Mariam W. Edelman lawyers who have found and operated the Children Defense Fund 45 years ago, and other small workshops. Especially through the fellowship, I could realize how powerful the relationships are and how the power of mission connects us. Yes. I am a finite creature, but the UMW community is an eternal creature. It can fail alone, but it will not fail with the community. When we work as a community, we cannot stand helpless, and nothing remains worthless. I was able to come back to stronger life than death through Assembly 2018. 5월 17일부터 5월 20일까지 콜럼버스 오하이오(Columbus, Ohio)에서 열린 이번 어셈블리의 주제는 Bold(담대한)이라는 단어이다. 한 여성이자 어머니인 예수님의 어머니 마리아에 대한 이야기가 전개된다. 동정녀로서의 임신과 마굿간에서의 출산, 애굽으로의 떠남과 십자가의 고난 등 예수님의 어머니로서 함께한 33년의 신앙 여정은 그녀의 담대한 (Bold) 순종과 결단, 용기, 인내를 그리고 있다. 그녀의 헌신 된 삶을 다시 한 번 돌아보면서 내게 그동안의 삶에 있었던 신앙의 자세를 돌이켜보고, 앞으로 어떤 자세로 임해야 하는지 깊이 생각해보는 귀한 시간이었다. 집회 내내 5500여 명이 넘는 세계 각국에서 온 여선교회분들을 보면서 예수님을 사랑하는 그들의 열정에 많은 도전을 받았다. 또한 역대 한인 여선교회분들의 담대한(Bold) 활약을 보면서 예수님을 사랑하기 때문에 고난 속에서도 담대한 용기가 그 일을 가능하게 하였다는 것, 그 용기(Bold Action)를 내 마음 속에 간직하고 싶었다. 한인 여선교회 회원들의 소고춤과 한국말 찬양이 울려퍼질 때는 가슴이 벅차 오르기도 했다. 집회 전날 5월 16일에 루신다 볼드윈(Lucinda Baldwin) 여사의 묘지를 방문한 일도 평생 기억 중에 하나로 남을 일이 되었다. 1883년, 그녀의 지정헌금 88불이 지금의 수많은 한국 감리교인들의 복음의 씨앗이 되어 그중의 한 사람인 나 자신이 이 묘지 앞에서 감사의 예배를 드린다는 것이 하나님이 아니면 이루어질 수 없다는 생각이 들었다. 루신다 볼드윈(Lucinda Baldwin) 여사의 담대한(Bold) 결단과 헌신에 무한대의 감사로 마음이 숙연해졌다. 이번 2018 어셈블리를 마치면서 앞으로 예수님의 제자로서 살아가야 할 나에게 다시 한번 주님께 헌신하는 자세를 배우게 해준 귀한 기회가 되었다. 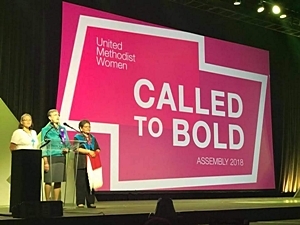 The theme for the 2018 UMW Assembly, which was held from May 17-20 in Columbus, Ohio, was being “Bold”. The theme was introduced in the story about a woman, the mother of Jesus, Mary. The story of her boldness from bearing a child as a virgin, giving birth to her son in the manger, fleeing to Egypt soon after giving birth, and witnessing her son to die on the cross reflects her difficult trials and tribulations. In addition, her obedience, determination, courage and patience are shown through her life. I look back on my life as a woman of faith and realize how I should live my life looking towards Mary as an example. 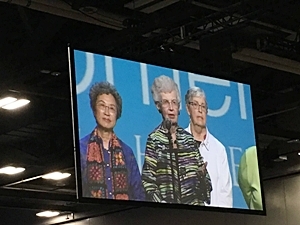 Being amid 5,500 United Methodist Women, at the Assembly from all over the world, challenged me as I witnessed their passion and love for Jesus. I was also challenged by how our Korean UMW’s predecessors lived their lives by taking bold actions through their courageous faithful life commitment to Jesus. I was overwhelmed by the presentation of Korean UMW’s Small Drum Dance and by the Korean praise songs sung by the entire UMW members. 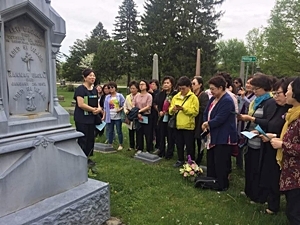 The day before the Assembly, we, the KUMw, visited Lucinda Baldwin’s grave in Ravenna, Ohio. In 1883, as a member of the First UMC of Ravenna, she designated her mission offering of $88.00 for the women in Korea. The offering she gave impacted many women in Korea as many became Christian. It was a heart moving experience that displayed how our God could work through people to bring His Kingdom to the masses. In my heart, I am grateful for Lucindy Baldwin for her boldness, determination, and dedication to give an offering to the women in Korea whom never had a chance to hear the Good News. 1995년 베이징에서 열린 세계 제4차 여성 회의에서 UMW의 회원이자 당시 미합중국 대통령의 부인이었던 힐러리 클린턴 여사가 연설한 내용 중 한 대목이다. 항상 내 마음속에 새겨져만 있던 이 문장들은 UMW Assembly 2018을 참가함으로써 생기를 얻게 되었고 살아 움직이게 되었다. 자유롭게 말할 권리, 그리고 그 소리가 들려질 권리를 직접 보고 경험하고 실천했기 때문이다. 시간이 흘러도 가슴 벅찬 기억으로 남아있는 그 경험들은 바로 다음과 같다. 첫째, 볼드윈 여사가 다녔던 리벤나 제일감리교회와 볼드윈 여사의 묘지를 방문한 것이다. 본인에게 가장 아프면서도 귀중했을 88불을 한국을 위해 헌금한 그녀의 헌신을 더 이상 책이 아닌 현장에서 느끼고 경험할 수 있었다. 미국에서 여성이 목소리를 낼 수 있게 된 지 얼마 되지 않은 그 때 그 권리를 행했던 한 여사의 실천과 그 소리가 들려질 권리를 행한 이들의 발걸음이 곧 한국 땅에 복음의 씨앗을 뿌렸던 것이다. 이는 곧 오늘날 내가 하나님께 드릴 수 있는 ‘88불’이 무엇인지 매 순간 생각하고, ‘오늘의 88불’을 아침마다 정해서 ‘행동’하게 하는 계기가 되었다. 둘째, 우분투에서 만난 할머니들의 열정과 섬김이다. 식료품 저장고에서 봉사활동을 했던 우리 팀에게 깁스한 다리와 연약한 육체는 하나님의 사랑을 실천하는 것에 전혀 문제가 되지 않았다. 나도 겨우 들었던 무거운 수 많은 캔과 쥬스들을 그들은 오히려 나보다 앞장서서 들고 옮겼다. 서로 모르는 사람들끼리 만나서 협동해야 하는 일을 해야 하는 그 순간에도 우리 팀은 자유롭게 서로의 의견을 말하고, 경청하면서 몇백 킬로그램에 해당하는 짐들을 운반하고 정리할 수 있었다. 이미 매 순간 그리스도인의 삶을 살아내고 있는 그들의 모습은 그 누구보다 아름다웠다. 셋째, 시위를 통해 보여준 진정한 대의와 정의의 실천이다. 시위의 자리에 모였던 자들은 당장 자신의 이익을 위한 것이 아님에도 불구하고 그 누구보다 그 시위에서 자유롭게, 크게, 당당하게, 담대하게, 적극적으로 외치고 참여하였다. 비가 와도 그 자리를 끝까지 지키려 하였으며, 모르는 사람과도 웃으며 서로 한마음이 되어 뭉치고 있었다. 이것이 진정한 대의를 위한 실천이며, 평화롭게 모두가 평등하고 행복할 수 있게 하는 정의의 실천이 아닐까? 넷째, 워크숍에서 보여준 참가자들의 경험을 바탕으로 한 진솔한 대화이다. 내가 참여했던 웍샵에서는 늘 참가자들의 ‘경험’이 가득한 대화들이 오갔다. 그들은 실제로 삶에서 ‘실천하는 신앙’이 있었기에 무언가를 말할 수 있었고, 비슷한 내용이어도 배경과 과정이 다르기에 더 넓은 관점으로 피드백이 있을 수 있었다. 이는 다음 세대를 위한 행동의 발전으로 곧 이어졌다. 다섯째, 다양성과 공통성이 동시에 존재하는 문화와 만남이다. Assembly의 공식적인 모임에서는 항상 다양한 인종이 섞여 있었다. 찬양 또한 다양한 국가의 언어로 이루어졌다. 그런데 분명 그 다양하고 많은 이들이 그 자리에서 서로 하나였다. 하나님의 마음을 구하고, 하나님의 뜻이 이 땅에 이루어지길 바라는 마음으로 이미 친구였고, 가족이었다. 서로 다른 것을 인정하고 존중하는 배려의 중심에는 말할 수 있는 권리를 행했던 실천과 그 목소리가 들려질 권리를 행한 실천이 탄탄하게 자리 잡고 있었다. 특히, 미국의 한 여성 감독이 무대에서 수화로 함께 찬양하는 모습은 귀로 들리는 소리만이 다가 아니라는 것을, 그래서 약자들도 소리 낼 수 있다는 것을 보여주는 아주 감동적인 모습이었다. Assembly에 모인 이들은 이미 담대함의 힘을 알고 삶에서 실천함으로써 더 큰 힘을 만들어내고 있는 자들이었다. 바로 듣는 담대함, 외치는 담대함 그리고 행동하는 담대함 말이다. 우리는 이것을 위해 인류의 역사에서 얼마나 많은 자발적 희생과 눈물들이 있었는지 기억해야 할 것이다. 그리고 이것을 헛되이 하지 않기 위해 이 실천을 이어서 해낼 의무가 바로 지금 우리에게 있다. 하나님이 보내신 천사의 음성을 들었던 담대함, ‘네’라고 답하며 찬양했던 담대함, 그리고 행동했던 담대함을 보여준 예수님의 어머니 마리아의 용기는 이 시대가 가장 필요로 하는 것이라 생각한다. 그 용기를 바로 하나님의 딸들인 우리 감리교 여성들이 이 지구촌 각자의 삶의 자리에서 ‘하나님의 방식’으로 먼저 보여주고 있기에, 나는 이 땅이 이미 하나님의 나라라고 감히 확언한다. 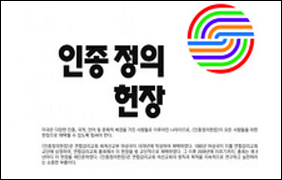 UMW Assembly를 통해 신학도로서의 내 관점과 생각의 지평이 확장되었다. 보지 못했던 곳까지 보게 되고, 더 창의적인 관점을 가지게 되었으며, 한 사람으로서, 한 여성으로서, 한 신학도로서 한 단계 성장하였다. 그리고 그 무엇보다 하나님의 자녀로서 더 깊어질 수 있었다. 이러한 시간과 기회를 주신 하나님께 이 모든 영광을 올려드리며, 아낌없는 후원을 해 주신 스크랜턴 여성리더십센터에도 진심 어린 감사를 드린다. This quote is from one of the speeches Mrs. Hillary Clinton, a member of the United Methodist Women (UMW), made at the United Nations Fourth World Conference on Women in Beijing in 1995. At that time, she was the First Lady of the United States president. These sentences, which had always been carved in my mind, got animated and were made alive by my participation in UMW Assembly 2018. I have seen, experienced, and practiced the right to speak freely and the right to be heard. The followings are the experiences that remain as overwhelming memories. First, I was able to visit the First United Methodist Church of Ravenna, where Mrs. Lucinda Brown Baldwin attended, and her memorial. I was able to feel and experience her dedication through her offering of $88 to help the Korean women. That $88 was originally something painful yet most valuable to her. 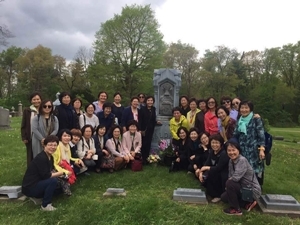 At a time when women in the United States were just being given the rights to speak for themselves and have their voices be heard, one woman exercised those rights and took steps to the sow the seeds of the Gospel on Korean land. This served as a realization in me to think about what my ‘$88’ is that I can give to God every moment and arrange the ‘$88 of today’ every morning and act upon it. Second, the passion and service of the old ladies I met at Ubuntu. For our team, who volunteered in a food pantry, a casted leg or weak bodies were no problem in practicing God’ love. They were the ones who carried a lot of heavy cans and juices that I could barely lift, rather than me. Even though we were all meeting for the first time and didn’t know each other, we had to cooperate and work together to get things done. While working, our team was free to talk and listen to each other, carry and organize the loads of several hundred kilograms together. Those who are already alive every moment of their Christian life are more beautiful than anyone else. 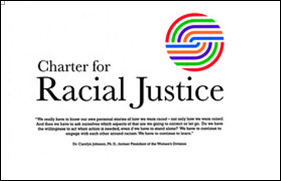 Third, the practice of a truly great cause and justice demonstrated through the rally. Those who gathered at the rally spoke out more freely, loudly, confidently, boldly and positively than anyone else, even though it was not for their own benefit. They were willing to keep standing and stay, even in the rain, and they were united with smiles. Is this not a practice for great cause and justice that will make everyone equal and happy in peace? Fourth, the honest conversations that the participants had with each other based on their experiences in the workshop. The workshops I participated in always had conversations full of ‘experiences’ from the participants. They were able to say something because there was a ‘practiced faith’ in their lives. Also, even though their thoughts and opinions were similar, there could be feedback from a wider perspective because the background and processes were different. This soon led to the development of action for the next generation. Fifth, the meeting of cultures in which diversity and commonality existed at the same time. There was always a diversity of different ethnicities at the official community gatherings of the Assembly. Praise songs included the languages of various countries, but I can confidently say that we were all one at that moment. We were already friends and family when we sought out the heart of God and hoped that God’s will be fulfilled on this earth together. With consideration, acknowledgment and respect of one another as our center, there was a solid practice of exercising the right to speak and be heard. I was very impressed that one-woman bishop of the United Methodist Church praised God with sign language on the stage. It shows that sound can be heard not only with our ears but also with our hearts, so the weak people can also speak out and listen. Those who gathered in Assembly already knew the power of boldness and were making more power by practicing in out in their lives. The powers are listening boldness, speaking boldness, and acting boldness. We must remember how many voluntary sacrifices and tears were in human history for these powers. Now, it is our duty to do these practices for the boldness to not be in vain. The courage of the Virgin Mary, who showed the boldness of hearing the voice of the angel sent by God, the boldness of praise and acting in answer to ‘yes’, is what this age needs most. I am convinced that this land is already the kingdom of God because our Methodist women, the daughters of God, are showing their courage and the way of God first. Through UMW Assembly, my perspectives, horizons and thoughts as a theology student have expanded. I have been able to see things that I have never seen, have more creative perspectives, and grow up as a person, a woman, and a theology student. Most importantly, I was able to grow deeper as a child of God. I am grateful to Scranton Women’s Leadership Center for giving me this opportunity and generous support. All glory to God! 예수님이 마지막으로 제자들에게 당부하신 말씀. 가서, 제자를 삼으라고 하신 말씀에는 도대체 어떤 의미가 있을까? 우리는 누구에게 복음을 전해야 하는가? 그 사명은 생각보다 쉽지 않았고, 역사적으로 누구에게 전달하느냐에 문제는 늘 이슈였다. 왜냐하면 이것은 기득권과 파워의 문제이기도 했기 때문이다. 나를 구원한 예수님이 나와 다른 사람을 구원하는 것을 우리는 과연 원하는가, 나의 유익을 버려가면서까지? 나조차도 넘어야 할 많은 고정관념과 경계선이 있다는 것을 보았기 때문에, 목회자로서, 다양한 사람들에게 복음을 전할 준비 되었을까? 는 오래된 질문이었다. 그런데... 놀라운 것은 그 옛날 누군가는 그 경계선을 넘었고 소외된 자들에게 희생 해가며 말씀을 나누었고, 그로 인해 지금 여기에 내가 있다는 사실이었다. UMW Assembly는 이러한 이유에서 나에게 큰 의미로 다가왔다. 전국 여선교회 여성들이 4년을 기다린 끝에 모인 큰 잔치, 여성이 여성을 위한 모임을 만들기까지의 수많은 노고, 그리고 한 푼 두 푼 모아 교회를 세우고 다음 시대를 세우는데까지 오기까지 얼마나 많은 이야기가 있었을까 하는 생각이 나의 가슴이 뭉클하게 했다. 어려운 시대 가운데, 또 다른 희망의 상징을 본 것 같았다. UBUNTU를 참가했는데 거기서 만난 여성들의 이야기는 흥미진진했다. 한 여성분이 한 이야기는 노숙자 사역을 했는데, 그 가운데 이유도 없이 자신을 매주 도와주던 두 여성 때문에 UMW를 참가하게 되었다는 이야기를 했다. 작은 일이지만, 자신이 있는 그 자리에서 삶으로 사랑을 나누는 것이 바로 예수님이 제자들에게 당부하신 제자 삼는 일의 시작이 아닐까 생각해보게 되었다. 두 번째로, UMW모임에 서 만난 백인 여성분은 어떻게 젊은 여성이 교회에 참여할 수 있느냐에 대해서 내게 물었다. 내가 그에게 해줄 수 있는 말은, 젊은이들에게 세계를 나와서 볼 수 있는 기회를 더욱 주고, 리더십 훈련을 제공하고 그들만의 언어로 소통할 안전한 공간을 주고 멘토가 되어주는 일이라고 했다. 또 그런 여성들의 헌신으로 지금의 내가 여기에 있다는 이야기를 했다. 한국에서 큰일을 하고 있는 여선교회와 스크랜턴 여성리더십센터의 일이 이제는 단순히 한국에서의 일뿐만 아니라, 세계인이 궁금해할 단체이자 프로그램을 제공해 줄 수 있는 곳이 되지 않을까 생각을 했다. 고정관념을 깨고, 기득권을 양보하고 이를 넘어서 후대를 키우고자 하는 그 마음이 바로 예수님이 제자를 삼으라고 한 바로 그곳이 아닐까 생각해본다. 셋째, 한국에서, 미국 각지에서 온 여전히 활동적이고 생명력 있는 어머니들을 보면서 참 감사한 마음이 들었다. 또한 젊은 여성들의 빛나고, 궁금증 어린 눈빛들 그리고 그들이 나눈 꿈 이야기들은, 10년전 내가 처음 참석했던 젊은 여성 프로그램을 떠오르게 했다. 한편, 받은 그 사랑을 돌려줄 때가 오는구나 하는 마음이 들었다. 내 삶이 단순히 나의 삶에 그치는게 아니라, 다음 세대를 위한 어떤 주춧돌이 되었으면 하는 꿈을 한 번 더 꾸게 되었다. 이 큰 그림에 한 점이 되었다는 것에 감사함을 가지는 시간이었다. 이번 여행을 통해, 자신이 누구인지, 어떤 일을 할 수 있는지 상상하지 못하는 어려운 자들에게 가서 꿈을 꾸게 하고 함께 정의를 외치고 돕는 일을 해야만 할 거라는 생각이 들었다. 고마운 마음과 빚진 자의 마음이 공존하는 순간이었다. 이렇게 참가하고 힘을 얻어갈 수 있도록 후원해 주시고 응원해주신 모든 분께 진심으로 감사드리고, 또다시 만나는 날까지 각자 자리에서 빛나길 응원하고 소망해본다. In the Gospel of Matthew, the last words of Jesus are to commission His disciples to go and make disciples of all nations. These words have raised many questions in my mind. Why should we go? Should I say “Yes” to Jesus, just because he asked me to?! Another question came to me. To whom should we convey the Good News? While I was studying theology and working as associate pastor in the United Methodist Church (UMC), I used to think how difficult it is to overcome my stereotypes and boundaries about whom to love and to whom I should deliver good news. Who should I make as disciples? Only Asian young ladies? Historically, to whom Jesus could be a savior to has been an issue. There are many reasons for this. I see that one reason could be a power dynamic that exists among Christians who want to take advantage of their religion because they think it makes them a privileged group. If that is truly what has happened, there should be someone who challenges them and decides to deliver Jesus’ message to all the people who have been marginalized, people such as women, the poor, and people of color. But then I realized: Here I am. I am that person who can challenge privileged Christians and speak to the marginalized. The women of UMC’s faithful community across the country have been waiting for UMW Assembly for four years, and a big and important festival just took place. This 150th anniversary has given me hope that even though we still have lots of issues to figure out to bring about social justice, right now we can inspire disciples for the next generation. It was an inspiring moment that allowed me to see thousands of women gathered together to share their powerful stories. Seeing so many women together was such an encouraging sight. As I looked at them, I said to myself, “Here I am. I am here because there were so many women who had struggled for sexual equality for women, for human rights, and against ageism, against racism…” I am so proud to be part of it. Through United Methodist Women (UMW), I have met wonderful women and heard their testimonies. First, I met a lady through Ubuntu and she shared her story of how she became involved with UMW. In the 1970s, she worked for a homeless shelter and two women came in and then showed up as volunteers every week for a year. She said it was good news for her that some people want to do the right things without expecting to receive something in return. The two women were from UMW. From that time, the woman at Ubuntu said that she has been working hard and actively for UMW. Where we find needs in our local community, that is the place we are called to deliver the good news by acting and sharing love with our neighbors. Second, a Caucasian lady came to me and asked how to bring young people to their community. 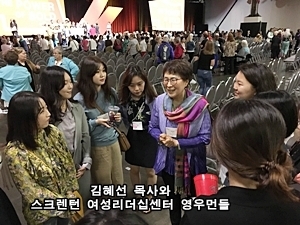 What I told her is what I have experienced in my own life through Scranton Women’s Leadership Center (SWLC) and Korean Methodist Women’s Society of Christian Service (KWSCS). The women in these organizations are dedicated to helping the next generation grow and they have invested their time and money to provide this young generation with more opportunities to see the world. Their efforts allowed me to develop my own leadership skills; they provided me with a safe space to make new friends and to communicate with them all over the world. The women in these organizations are still my mentors. When we plant one small seed; when we follow one small dream, we women can make changes in the world. That is what brought me here to where I am now. Where discrimination based on age (prejudice toward young people) has disappeared, women have been able to inspire the next generation. If women work together to support, love, and guide the next generation, that will be the place where Jesus wants us to go and make disciples. 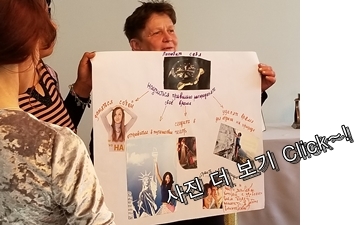 Scranton Women's Leadership Center (SWLC) and the Korean Methodist Women’s Society of Christian Service (KWSCS) are doing a great job in Korea, but they are not doing their job only for Korea. They can serve as a great model for the world as they carry out the work of Jesus which is to make disciples of young people of the next generation. Lastly, I was so grateful to see the women I think of as my mothers who have dedicated their lives to make changes in the world. These women are still youthful and active, and I see in them the shining eyes of young women, still with their curiosity and their dreams. Seeing them reminded me of the young women's program I first attended ten years ago. I have a feeling that the time has come to return the love I received when I needed guidance. I firmly believe that my life is not merely for myself, for my own growth, but it should be of benefit to the next generation. Giving more space and opportunities to the younger generation and supporting them is where I should deliver the good news as Jesus commanded. I am so proud to be part of this group. This trip to Ohio has given me a great deal of inspiration. I was fully charged with energy and gratitude by meeting my previous mentors and friends again who helped and supported me to become who I am now. Their presence here has meant a lot to me. Finally, I want to say: “I am here and I am the one who got to hear the Good News from them when I was struggling. And now I ought to deliver good news to young people who have not yet had any opportunity to be all they can be and to let them know that they deserve the right to dream to make changes in the world.” I want to thank everyone who helped me to dream bigger than I thought I could and I hope all of you will be well and will continue to shine in your special place until the day we meet again. 2018 UMW의 공식적인 행사에 참여하기에 앞서, 미국과 한국에서 귀한 사역을 감당하고 계신 여선교회분들과 스크랜턴 센터를 통해 참여한 참가자분들과 함께 오하이오주의 라베나 라는 지역을 방문했다. 우리나라에 복음의 씨앗을 뿌린 최초의 여성 선교사를 파송할 계기를 만든 루신다 브라운 볼드윈(Lucinda Brown Baldwin) 여사의 묘지를 방문하며, 그의 삶에 대한 이야기를 들을 수 있었다. 성경에는 헌금함에 두 렙돈을 넣은 가난한 과부의 이야기가 나온다. 두 렙돈은 아주 적은 돈이나 예수님께서는 그를 보시고 ‘가장 많은 헌금을 한 자’라고 부르신다. 예수님께서는 헌금함에 들어간 절대적인 금액보다 그 헌금을 하자고자 한 이의 절대적인 마음을 보셨던 것 같다. 그리고 1800년대에 88달러를 헌금한 한 여성이 있다. 루신다 볼드윈 여사가 살아있던 1800년대에, 여성은 투표권은 물론이고, 재산조차 가질 수 없었다. 그들이 결혼했더라도, 모든 것은 남편의 소유였다. 여성들은 남성들과 평등해지고자 노력했지만, 그들은 1919년이 되어서야 투표권을 가질 수 있었다. 어느 날, 루신다 볼드윈 여사는 기독교 잡지에서 조선에 대한 기사를 읽게 됐다. 그 기사의 내용은 조선인 여성들은 심지어 이름도 갖지 못한 채, 누구의 아내, 누구의 딸, 누구의 누이라고 불린다는 것이었다. 또한, 그들은 교육조차 받지 못한다는 내용을 본 그녀는 조선의 여성들이 살아가는 모습이 당시 미국 여성의 모습과 다르지 않다고 생각했다. 미국의 여성들이 배울 수 있었던 것 또한 ‘적절한 아내’가 되는 법뿐이었기 때문이다. 1882년 그녀의 남편이었던 하베이 볼드윈(Harvey Baldwin)이 죽은 뒤, 그녀는 그 남편의 재산을 정리해 조선에 선교비를 보내기로 마음먹는다. 그녀는 선교비를 보내면서 “잔돈같이 적은 돈을 보냅니다. 그리고 이 돈이 중심이 되어, 땅끝까지 하나님을 알게 될 때까지 꺼지지 않을 불을 하나라도 더 켜기 위하여 교회가 모이는 데 도움이 됐으면 합니다.”라는 말을 남겼다. 그녀의 편지와 작은 선물은 많은 기독교 여성들에게 감동을 줬고, 각자 식탁 위에 있는 잔돈 상자에 돈을 모으게 되는 계기가 된다. 그리고 이 일을 통해, 한국에 최초의 여성 선교사가 들어오게 된다. 한국 최초의 여성 선교사였던 메리 스크랜튼(Mary Scranton)은 의사였던 그의 아들과 함께 복음을 전했다. 하지만 당시는 백인들이 어린아이들을 잡아먹는다는 소문이 돌았었고, 그것이 그녀의 선교를 힘들게 했다. 그녀 외의 다른 선교사들도 두려움의 대상이 됐다. 하지만, 사람들은 지속해서 예수님의 빛을 전하는 메리 스크랜튼과 그의 아들을 점차 좋아하게 됐다. 그녀는 부모님이 아픈 어린 소녀들을 돌봤으며, 우리나라 소녀를 입양하기도 했다. 그리고 그녀가 교육에서 소외된 어린 소녀들을 가르치기 위해 세운 학교는, 이화여대의 전신이다. 볼드윈 여사는 이 세상의 모든 사람이 모든 것의 창조자이시며 우리 한 명, 한 명을 모두 사랑하시는 하나님을 알게 되기를 바랬다. 그리고, 볼드윈 여사의 이름인 루신디(Lucinda)는 스페인어로 ‘빛’이라는 뜻이다. 루신다 여사가 선교사들이 나누기를 바랐던 내용은 다음과 같았다. 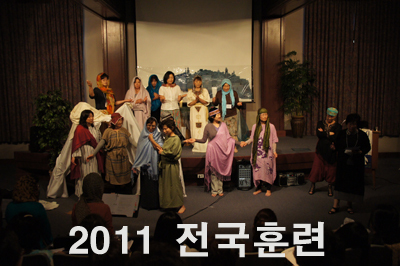 볼드윈 여사에 대한 짧은 설명을 들은 뒤, First United Methodist Church에서 준비해주신 점심을 먹었다. 식사를 준비해주신 분들은 모두 백발의 할머니들이셨다. 한국에서 온 우리들 40여 명을 위해 그 많은 양의 식사를 준비해주신 것이다. 정말 크게 감동을 하였던 것은, 식사를 마치고 빈 그릇을 부엌에 가져다드리며 마주친 교회 분께 “여사님 정말 감사합니다”라고 인사하자 정말 밝게 웃어주시면서 “무엇을요, 당신이 와줘서 정말로 기뻐요”라고 대답해주신 것이었다. 그 여사님께 나는 그들이 오래전 파송한 선교사로 인해 복음을 듣고 기독교인으로 성장해 그들을 다시 방문한, 그들의 선교사역의 결실처럼 보였을지도 모르겠다. 식사 이후, 볼드윈 여사의 묘지를 방문했다. 여사님의 묘비를 둘러싸고 기도를 한 뒤, 찬양을 부르고, 다시 기도했으며 짧게 말씀을 나눴다. 헌화를 하고, 찬송을 부르고 주기도문으로 짧은 예배를 마쳤다. 같이 찬양을 부를 때는 가슴 속에 벅차오르는 감동이 있었다. 저녁에 숙소로 다시 돌아와 오늘 느꼈던 점을 나누는 시간에 누군가는 그 묘지에 있던 민들레 홀씨를 보고 큰 감동을 받았다고 했다. 씨앗이 땅에 떨어져 죽지 않으면 그대로 있고, 죽으면 많은 열매를 맺는다는 요한복음의 말씀처럼 그 한 알의 씨앗이 볼드윈 여사처럼, 스크랜턴 선교사처럼 보였다는 것이다. 한국은 지금 미국에 이어 가장 많은 선교사를 파송하는 나라가 됐다. 약 140년 전 들어온 선교사들로부터 전해 들은 복음을 이제는 우리가 다른 나라에 전해주는 것이다. 예수님께서 말씀하신 그 한 알의 씨앗이, 믿음이 작은 자인 내가 될 수 있을까? 라는 질문이 내 안에 떠올랐다. 그리고 이내, 내가 하려고 하면 할 수 없지만, 하나님께 내어드리면 그가 일하시리라는 마음이 자그맣게 피어났다. 우리는 모두 분명히도 하나님의 씨앗일 것이다. In the Bible, Jesus tells a story about people going to the front of the temple to drop in their offering. Rich folks had a lot of coins to drop in the box, but a widow only had two half pennies, and she put them in the box. Jesus said the widow had given more than all the rest because she gave all that she had. It was the generosity that counted, not the amount. And there is a woman who similarly offered $88 in the 1800s. In the 1800s, when Lucinda Brown Baldwin was alive, American women could not vote. If they were married, they could not own property, because everything belonged to their husband. Women were trying to become equal, but they didn’t get to vote until 1919. One day, Lucinda Baldwin read in a Christian magazine that Korean girls were not given a name, but referred to as the wife of, the daughter of, the sister of. It wasn’t so different from how women felt here but the article went on to say that girls were not worth educating. It took many years to get past just learning to be a desirable wife. In 1882, after her husband Harvey Baldwin passed away, she was able to make the decision to send $88 to mission work on her own. Lucinda Baldwin was moved to be the first one to send $88 so a female missionary could go to Korea and help young girls go to school and live like Christians. She sent a letter with her gift. In her letter she called herself an aged servant of God. She said she was “sending a widow’s mite, praying that it might be the nucleus around which the contributions of the Church should gather, until one more fire should be lighted, never to go out until the knowledge of God should reach every land”. Her gift and letter were shared. Christian women who read Lucinda’s letter were inspired to put small amounts of money in mite boxes on their kitchen tables. And with that, the first female missionary was sent to Korea. Mary Scranton went to Korea with her son, the doctor, and became the first female missionary there. But there was much distrust of Americans. There were rumors of Americans hurting Korean children. Missionaries were martyred out of fear yet people like Mary Scranton and her son continued to come to share the light of Jesus. Mary took in a young girl whose parents were sick, and then she adopted a Korean orphan. She started a school, which became the largest women’s college in the world; EWHA. Mary Scranton spent the rest of her life in Korea. Lucinda Baldwin wanted people all over the world to know that God, the Creator of the Universe loved every one of them. The name “Lucinda” comes from the word “Light” in Spanish. Here is the lesson that Lucinda Brown Baldwin wanted the missionaries to share. “Our God, Creator of the universe loves you this much. He is not a light or a kind of light. He IS the light. BY opening His mouth, He created the sky, sun, moon and the stars. In Heaven there can be no darkness. There can be no sin. In John 3:16 we read that God so loved the world that he gave his only Son, so that whosever believes in Him would not perish, but have everlasting life. That was you and me that God loved! Becoming a believer is easy as ABC. Admit you are a sinner and ask for forgiveness. Believe that Jesus, who had no sin, died on the cross, taking the punishment for our sin. His blood washed us clean. After 3 days He rose from the dead and now sits at the right hand of God, the Father in Heaven. Choose to follow Jesus. The gift of salvation is offered to all of us. We don’t deserve it but are offered it by the grace of a Creator who loves us. Like all gifts, we can accept it or reject it. It is never forced on us. None of us deserve the gift. And none of us can be bad enough not to be offered the gift. We are offered it through the Grace of the One who loved us. If you say yes, you are asked to pass it on. After hearing a brief explanation about Mrs. Baldwin, our team had lunch prepared by First United Methodist Church. The people who prepared the meal were all gray-haired ma’ams. They prepared a large meal for 40 of us from Korea. I was really impressed. After eating, I brought an empty bowl to the kitchen, and I said to the church, "Thank you so much ma’am". And one lady replied "You’re very welcome. I’m so glad you came.” To the lady, I might have seemed to be the fruit of their missionary work, heard the gospel and grew up to be a Christian thanks to the missionaries they sent long ago and visited them again. After the meal, our team visited Mrs. Baldwin's grave. We prayed around the tombstone, sang praise, prayed again and shared. We gave flowers, sang a hymn, and finished a short service with the Lord’s prayer. When we sang together, a wave of emotions arose in my heart. When we returned to our hotel in the evening to share what he had felt today, someone said she was moved watching the dandelion seeds. Like John's gospel says, "If a seed falls on the ground and does not die, it will remain the same; if it dies, it bears many fruits." One round seed looked like Mrs. Baldwin, like a Scranton missionary to her. Korea is now the country that has the largest number of missionaries after the U.S. We heard the gospel from missionaries who came in about 140 years ago, and now we deliver it to other countries. There comes a question in my mind, “Can a person like me with little faith be a seed of God?” And soon, the thinking arose in me that it is possible. Because God works in me, the one who works is not me, but God. We are God’s seeds. We must all be God's seeds. 몽골선교를 다녀올 수 있도록 마음과 형편을 허락하신 주님께 감사와 찬송을 드립니다. 3월부터 몽골선교를 위해 기도하고 웍샵 준비를 하면서 몽골팀을 위해 주위에 중보기도를 부탁하고 준비했습니다. LA에서 이한희 장로님,박옥란 권사, 워싱턴DC 에서 이경신 장로님, 서울 스크랜턴센터에서 송주희 인턴이 인천공항에서 만나 반가운 인사를 나누고 몽골 울란바트루로 가는 비행기를 기다렸습니다. 그런데 연착된 비행기가 한밤중에 공항에 도착하여 김경희 선교사님, 그레이스 조 선교사님이 픽업을 나오셨습니다. 어두운 울란바트루 시내를 지나 호텔에 도착하여 몽골에서의 첫날 밤을 보내고 다음 날 오전에 홍흐르 구치소를 방문하여 이경신 장로님께서 ‘돌아온 탕자’라는 말씀으로 구치소에 있는 분들에게 희망의 메시지를 전했습니다. 구치소에 필요한 물품구입을 위해 헌금을 드리고 돌아오는길에 카이로스선교센터에 들려 공방, 체육관, 도서실 등을 둘러보았습니다 . 앞으로 세워질 크리스천학교에 대한 설명을 들었고, 게르츠 감리교회를 방문하여 우르제 목사님의 말씀과 비전을 듣고 다음 날 부터 있는 몽골 기독 여성훈련을 위해 호텔에 돌아와 휴식하며 다음 날을 준비했습니다. 기대와 설렘으로 도착한 선교센터에는 많은 여선교회 회원들이 일찍부터 와서 우리를 기다리고 있었습니다. 시간이 되어 개회 예배를 드리고 성경공부와 공동체훈련, 웍샵 등 매시간마다 은혜롭게 지나갔습니다. 시간마다 주시는 은혜와 기쁨, 열심히 배우는 몽골 여선교회 회원들..
발표도 잘하고 그림도 잘 그리고 스펀지처럼 잘 받아들이는 현지 여선교회 회원들을 보면서 선교사님의 훈련과 눈물의 기도가 있었음을 느꼈고, 즐거운 장기 자랑과 몽골의 기독교 역사에 대해 배우며 새롭게 몽골에 대해 알아가는 시간이었습니다. 평가와 미래의 비전 세우기 시간이 되었습니다. 이번 훈련을 통해 느낀 점( 부족함과 좋았던점)과 다음 훈련에서 배우길 원하는 내용에 대해서 참가자들의 의견을 듣는 시간이었습니다. 참가자들은 노인사역과 fundraising, 교회와 다양한 여성 사역, 세대간의 대화를 통해서 많은 배움과 도전을 받았다고 말하였습니다. 우리 인도자들은 몽골 여선교회분들로 부터 게르 인형 선물과 감사 카드를 받았고, 앞으로도 서로를 위해 중보기도를 하기로 했습니다. 서로 손을 잡고 폐회예배를 드리며, 마지막에는 한 사람씩 돌아가며 안아주고 축복해 주었습니다. 우리는 서로 아쉬운 마음을 달래며 다음을 기약하였습니다. 주일예배는 우리들이 3개의 교회로 흩어져 설교하고 은혜를 나누며 몽골 현지교회의 열약함과 우리의 기도가 필요함을 많이 느끼고 돌아왔습니다. 중보기도로 힘을 주신 전국연합회 한인여선교회 여러분께 감사드립니다. First and foremost, I would like to thank and give praise to our Father in heaven for allowing me to go to Mongolia on this mission trip. I have been diligently preparing myself since March for this trip by attending workshops, spending countless hours praying, and preparing my soul. Our mission team members were Elder Hanhee Lee from Los Angeles, myself, Elder Kay S. Lee from Washington D.C, and Intern Juhee Song from Seoul Scranton Center in Korea. We landed in Ulaanbaatar, which is the capital city of Mongolia and our destination, late at night. The next morning, we visited Hohhot prison and Elder Lee was able to share a sermon with the inmates about The Prodigal Son. We were able to provide the prison with necessary items and supplies as well. On our way back, we got to visit the Kairos Mission Center to tour their work space, library, and the gymnasium. We got to hear the future plans during our visit. We also visited Gertz United Methodist Church to meet with Pastor Urje to hear his sermon and the vision for mission works in Mongolia. Our next day was the Mongol Christian Women’s Seminar and we were greeted by many members waiting for our arrival. We were able to worship, read the words, and attend workshops together as fellow sisters in Christ. It was such a blessing to see so many of our fellow sisters praising and loving God. We all felt the amount of time and effort the missionary has put into this place and were very moved. 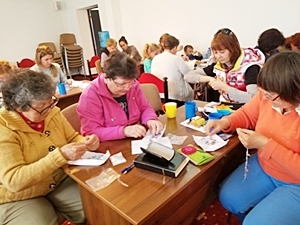 The second day consisted of praise, service, bible study, workshops, and crafts. Our day went by quickly and at the end of the day, we gathered together to evaluate and give feedback about the training. 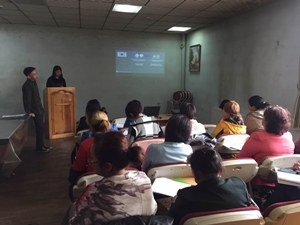 It was very encouraging to see so many of our sisters in Mongolia give constructive and well-thought-out feedback on the program. It was a great time of reflection and an opportunity for the UMW to plan what we can do in the future in Mongolia. Our time in Mongolia flew by so quickly as we had to part ways with our sisters and missionaries in Mongolia. I pray that we all continue to support them through prayer and love. I would like to give thanks to our Father and for all your prayers and support again as well. 키르키르스탄 이스쿨 수양관에서 59명의 참석자들이 참가해 “소명으로 역사를 이끌어가는 여성들”이란 제목으로 2박3일의 기독여성 지도자 훈련을 실시 하였다. 개인적으로 중앙아시아 기독여성 지도자 훈련은 올해로 3번째이지만, 항상 새롭고 많이 배우고, 신앙인으로서의 훈련과 도전을 받는다. 이번 훈련을 위해 뉴욕에서 3명(김명래, 이주희, 김순덕), 중앙아시아에서 2명(이 프르메 선교사, 율리아 목사) 그리고 러시아에서 1명(엘레나, UMW staff in Russia), 모두 6명의 지도자와 카쟉스탄과 키르키스탄의 여선교회 회원 53명이 모였다. 키르키르스탄의 수도인 비쉬켓에 모여 coach bus를 타고 수영관에 도착해 2박3일동안 하나님께서 베풀어 주신 은혜의 시간을 갖었다. 세계에서 두번째로 큰 염분이 있는 호숫가와 그것을 둘러싼 눈이 쌓인 큰 산맥들과 또 그것들을 둘러싼 흰 구름의 광경을 앞에두고 있는 수영관에서의 시간들은 안팎으로 아름다움을 체험하는 시간이었다. 내가맡은 부분은 주일학교 교육의 중요성과 자녀들과의 관계의 중요성을 배우는 시간이었다 . 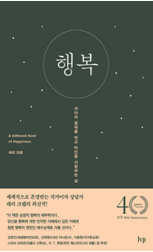 모인 모두가 어머니와 할머니들인데 , 어떻게 우리가 자녀들을 신앙인으로 잘 키울수 있을까를 고민하면서 신앙인으로서 가져야할 기본적인 자세와 자녀들을 향한 이해를 성경을 통해 배우는 시간을 가졌다. 이번 모임에서 특별했던것은 이주희 집사님이 이끄신 ‘Fundraising’ class였다. 처음으로 fundraising이 무엇인지를 배우는 그들에게는 새로운 도전이었다. 그리고 집사님이 가지고 온 물건들을 진열해 놓고 silent auction을 통해 fundraising의 한 부분을 직접 경험해 보는 시간도 있었다. 그리고 율리아 목사님/의사의 “여성과 건강” 세미나와 엘레나의 “여성과 그들의 섬김” 그리고 김명래 전도사님의 “섬김의 리더”란 제목의 성경공부가 있었다. 마지막 시간에는 각자가 느낀점, 배운점을 같이 나누고, 내년에는 무엇이 필요하고 배우고 싶은가에 대해 의견을 나눴다. 내가 이번 기회를 통해 배운점은 그들도 나와 동등한 여성으로서 문화와 언어, 사는곳은 다르지만 각자가 처한 위치에서 하나님의 여성들로써 자기에게 주어진 삶을 열심히 살아가고 있음을 알았다. 또한 이런 기회를 통해 각자의 삶과 생각,신앙이 한데 어우러져, 비록 다르지만 하나님 안에서 한 자매이고 가족임을 다시 한번 확인하는 시간이었다. 이런 귀한 시간을 허락하신 하나님께 감사드린다. 또한 한인여선교회 전국연합회의 기도와 후원 그리고 나를 귀한 장소에 보내 주심에 감사드린다. 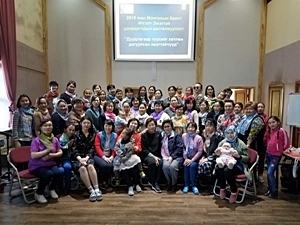 A Central Asia UMW’s leadership training took place at the Issyk-Kul Retreat Center, The topic was ‘Women Who Lead History with a Calling’. All together 59 participants stayed for 3 days. Even though this was my third mission trip to Central Asia, I always came back with a renewed spirit with many challenges. There were three people from New York - Myungrae Kim, JooHee Lee, and myself. Two from Central Asia - Prume Lee and Rev. Yulia. Lastly there was one person from Russia, Ellena, who is part of the UMW staff. Altogether, there were 6 leaders and 53 UMW members from Kazakhstan and Kyrgyzstan. We got together at the church center in Bishkek, the capital of Kyrgyzstan, and rode a coach bus to the retreat center. We truly had a wonderful blessed time together over the three short days. The Issyk-Kul retreat center is a beautiful place. It is surrounded by the second largest saline lake in the world. Issyk-Kul Lake (meaning warm lake), is surrounded by tall mountains with snow on top and white clouds circling around the peaks. It took the breath out of many participants by just looking at the nature in front of us, the retreat center was truly a blessed place to be. 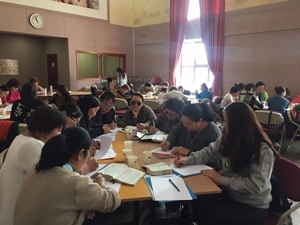 My workshop was on ‘Children Ministry.’ We all know how important it is to have children’s ministry in the church setting and at the home setting. We learn to value the relationship with our children at the beginning of their early age. All participants were moms, grandmas, and future moms. We faced a challenge of how to raise our children in faith in God in today’s world. We also learned through the Bible about our basic attitude and understanding toward our children. The special workshop featured was on the topic of ‘Finance and Fundraising’, offered by Joo Hee Lee. This was a new concept on what fundraising is and why it is needed for the women’s group of the church. The participants experienced the silent auction for the fundraising event that Ms. Lee hosted, which was an auction consisting of her donated items. It seemed that everyone enjoyed the event. There were several other workshops that took place. 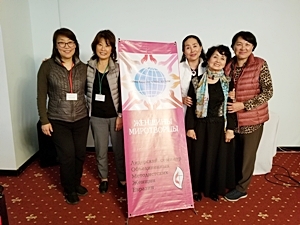 “Women and Health” was given by Dr. Yulia, “Women and their Ministry” by Ellena, and the bible studies on “Women Lead in Ministry” led by Myungrae Kim. At the end of the retreat we shared our experiences on what we learned, what we felt about the retreat, and our inputs on different workshops. We discussed what topics we would like to have for next year as well. 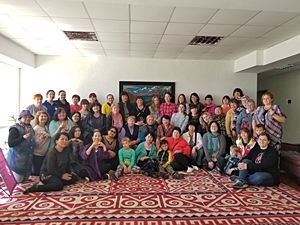 My experience with the Central Asia UMW tells me that they are committed Christian women who are learning, training, and struggling to become better persons in Christ. All of which applies to me as well, with the only difference being the culture, language, and the environment. We all believe that we are one in Christ, no matter where we came from, what background, or age. The life journey of faith in God is the same - and that is what makes us one in Christ. 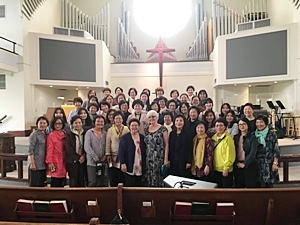 I thank God for giving us this valuable time together and also thanks to the National Network Korean United Methodist Women for its prayer and support. 분주하던 4월의 북가주바자를 뒤로하고 6월의 햇빛아래 주님을 찬양하며 예배하는 북가주연회 연합 찬양제가 6월2일 산타클라라 한인 연합 감리교회에서 열렸습니다. 여러 개체교회가 한곳에 모여 그동안 준비하고 연습한 찬양, 연주와 연극을 통하여 주님께 영광 돌리며 기쁨의 산제사를 드리는 올해의 찬양제에도 하나님은 함께 하시고 풍성한 은혜로 채워 주십니다. 지난 20여년을 돌아보니 년중행사 임에도 불구하고 늘 새로운 감격과 감사로 채워진 찬양제를 기억합니다. 이 연합 찬양제의 주인이 되시고 인도해 주시는 하나님의 사랑이 우리의 목소리를 통하여 세상에 전파되어 지기를 간절히 소망합니다. 부족한 저희들을 북가주 연회 여선교회 불러 모아주시고 믿음과 순종으로 하나님을 예배하며 찬양할수 있도록 모든 여권을 허락하시는 주님께 감사기도를 드립니다. 준비찬양, 기도, 그리고 말씀의 축복안에 1부예배 순서를 마치면 긴장과 설레임의 찬양제 2부 순서가 기다리고 있습니다. 찬양, 연극, 카드 퍼포먼스등으로 다양하게 주님을 찬양하는 이번 찬양제는 기대 이상입니다. 열심과 정성으로 준비해 주신 모든 회원들이 감사할뿐입니다. 북가주 연회 연합여선교회 찬양제를 통하여 개체 교회간의 연합과 아름다운 교제를 경험하며,드려지는 헌금으로 다가오는 선교학교 장학금과 청소년 수련회 보조를 할수있어서 우리의 기쁨을 더하여 줍니다. 특히 청소년 수련회의 부흥으로 교파를 초월하여 진행되는 행사에 북가주 연회 여선교회 찬양제가 이 지역사회를 섬길수있도록 우리를 사용해 주시는 주님께 감사 찬송을 드립니다. 이 찬양제를 위하여 함께해 주시는 목사님들과 성도님들, 그리고 모든 여선교회 회원님들께 진심으로 감사드리며 하나님의 한량없는 사랑과 은혜를 간구합니다. 우리 북가주 연회 연합여선교회가 주님만을 섬기며 말씀과 기도안에 순종하며 나아가는 축복을 간구합니다. 풍성한 은혜로 우리를 채워주시고 주님나라 확장에 우리를 사용하시는 하나님을 송축하며 머리숙여 감사를 드립니다. Busy April passed, and June’s warm sun greets us as we praise and worship at our Cal-Nevada joint worship was held on June 2, 2018. Through the praise, performance, and drama, which the congregations of various churches have prepared and practiced in one place, God is with you in this year's praise of glory and joy he has a generous debt of gratitude. Looking back over the past 20 years, I always remember the celebration which was filled with new emotion and appreciation despite the event during the year of the year. The love of God, who is the master and guide of this unity celebration, I sincerely hope that we will be told through our voices. 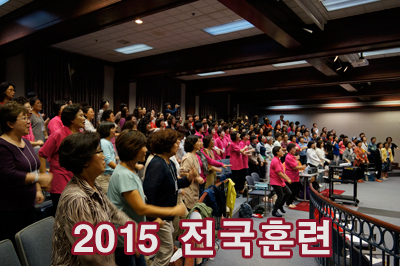 Bring in the Cal-Nevada Conference Korean UMW Network and God with faith and obedience. My prayer is with you, O Lord, that you may grant me all the circumstances for worship and praise. A celebration of tension and nervous feelings after the first service is completed in preparation, prayer, and the blessing of speech. Part 2 is followed by Praise, a play, a card performance, etc. This celebration is beyond expectation. All the members prepared with all their heart and soul. 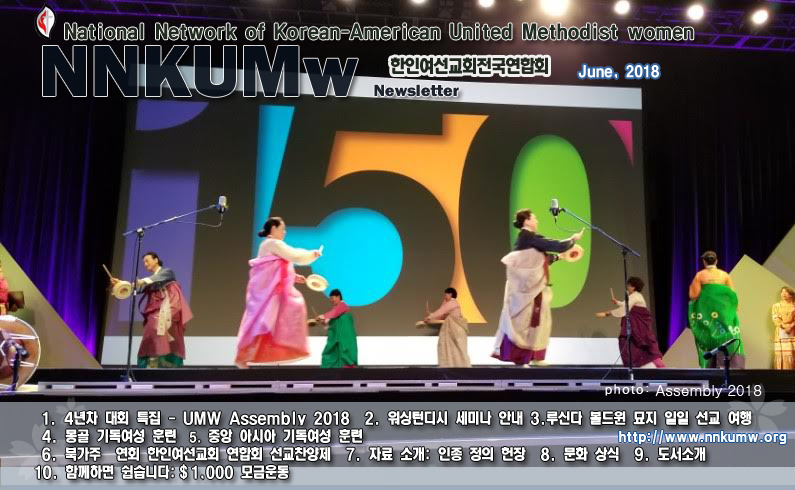 Through Cal-Nevada Conference Korean UMW Network’s praise night experiencing the union and beautiful relationships between the individual churches. The donations will give us more pleasure as we will be able to provide a scholarship for the coming youth retreat and support for the youth training. Especially to the Lord, who uses us to serve the community at a banquet in the north of the state for events that go beyond the religious circle due to the revival of youth training. To the pastors, to the congregation, and to all the members of the mission. I thank you from the bottom of my heart and hope for God's unfailing love and goodness. We, the Cal-Nevada Conference Korean UMW Network, were in attendance to the Lord and were obedient to his word and prayers. I pray for your blessing. That we may be filled with grace and that you may use us to extend your kingdom. I offer my thanks to you with my head down, praising you. “주의 성령이 내게 임하셨으니 이는 가난한 자에게 복음을 전하게 하시려고 내게 기름을 부으시고 나를 보내사 포로 된 자에게 자유를, 눈먼 자에게 다시 보게 함을 전파하며 눌린 자를 자유롭게 하고 주의 은혜의 해를 전파하게 하려 하심이라 하였더라” (누가복음 4:18-19) 연합 감리교회 여선교회 여성은 누가복음의 4장 말씀을 근거로 그리스도인의 사회적 행동과 약자의 편에선 옹호를 강조하며 지난 150년 동안 사회적 불의에 도전해 왔다. “연합감리교회 여선교회는 오랫동안 다양한 공동체가 되기 위해 노력해왔습니다. 교회의 인종 정의 헌장은 연합감리교회 여선교회 선배들에 의해 쓰여졌습니다. 20세기 초 교회의 차별정책에 맞서 우리는 지역 선교학교를 만들어 전부 흑인교회였던 중앙연회의 여성들을 지역 프로그램들에 참여 할 수 있도록 했습니다. 그리고 랭귀지 코디네이터들과 연회 여선교회 회장들을 위해 매년 개최하고 있는 보이시스 트레이닝(Voices training)을 통해 다양한 언어 및 문화공동체들이 성장하며, 서로의 차이점을 존중하고, 상호관계를 증진시키기 위한 방안들을 모색하고 있습니다.” 연합감리교 여선교회 국장 헤리엇 올슨은 다양한 인종, 국적, 언어 및 문화적 배경을 가진 사람들로 이뤄진 미국내에서의 ‘인종 정의 헌장’ 실천과 지속적인 관심의 중요성을 이렇게 강조하였다. 1.하나님은 모든 인류를 지으신 창조주이시므로, 인류는 누구든지 한 가족이며 하나님의 자녀이다. 2. 인종차별주의는 예수 그리스도의 가르침에 위배되는 행위이다. 3. 인종차별주의는 예수 그리스도의 구원과 화해를 부정한다. 4. 인종차별주의는 참다운 인간이 되지 못하게 하고, 사회, 경제, 환경 및 정치적 목적을 위한 명분으로 이용되고 있다. 5. 우리는 우리와 다른 인종에게 생각과 말과 행동으로 죄를 지었음을 하나님 앞에, 그리고 서로에게 고백해야 한다. 6.우리는 모든 사람이 성별에 관계없이 하나님의 형상대로 창조되었으며, 하나님 보시기에 똑같이 소중하다는 것을 믿는다. 7.인종과 문화의 다양성은 인류의 강점이므로, 우리는 개개인의 소중함을 인정하고 존중하는 세상을 만들도록 노력한다. 8.인류의 정의회복을 위해 우리는 새로운 인식과 자세와 인간관계를 형성하고, 그것이 교회와 사회의 법, 정책, 구조 그리고 실천방안에 반영되도록 노력한다. 이러한 믿음에 근거하여, 우리는 한 개인으로나 공동체로서 말과 행동으로 예수 그리스도를 따르며, 모든 사람과 단체들이 그들의 권리와 자주권을 행사할 수 있도록 함께 노력할 것을 다짐한다. 그렇다면 인종차별주의는 어떻게 시작되었나? 미국에 사는 기독교인들은 인종차별주의라는 유산을 물려받은 상속자들이라 할 수 있다. 이는 유럽계 백인 대다수가 미국을 비롯한 전 세계의 유색인종을 차별한 인종차별주의자이기 때문이다. 미국 역사 초창기부터 시작된 인종차별주의는 지금 이 순간까지도 지속하고 있다. 백인들에게는 백인이라는 특권이 주어지고 유색인들에게는 차별과 편견의 불평등이 유산으로 남겨졌다. 더욱이 인종차별주의는 성별, 경제 상황, 출신 국가 등 기타 다른 정체성 문제와 결부되어 그 파급효과가 더 증가하고 있다. 인종 정의 헌장에 대한 우리의 실천방안은 어떤 것이 있을까? 번성하는 이스라엘 민족을 이집트인들이 어떻게 차별하였는지를 보여주는 출애굽기 1장, 오늘날 미국에서 이집트인들은 누구이며 이스라엘인들은 누구인가? 인종 정의는 성서적 이슈이기도 하다. 그리고 인종 정의는 지도력의 이슈다. 지도자로서의 자리와 권력이 인종, 민족, 언어, 계층의 벽을 넘어 분배될 수 있도록 해야 한다. 그러기 위해 자선 행위보다는 상호 관계를 내세우는 제도적인 변화를 만들도록 노력해야 한다. 아울러 인종 정의는 공동체의 이슈이기도 하다. 거주하는 지역, 주, 나라에서 일어난 변화를 점검해 보자. 인종 그리고 민족 간 갈등과 긴장이 어디에서 일어나고 있는가? 인종 정의가 영적 삶에 일상이 될 수 있도록 힘쓰자. 이민자, 소수민족과 인종, 가난한 사람들이 공교육, 공공서비스 및 일자리를 얻을 수 있는 권리를 제한하는 법에 대해 배우는 것도 한 방법이다. 모두의 동등권과 기본권을 확보하도록 우리모두의 정치력을 모아 한목소리를 내도록 한다. 연합감리교회 여선교회 회원으로서 지금 내가 해야 할 노력은 무엇인가? 첫째로, 교회 안에서 그 어떤 종류의 인종차별주의도 용납하지 않으며 특히 여선교회의 선교 지원을 받는 기관들이 그들의 고용과 운영 정책에서 인종차별을 없애도록 한다. 둘째로, 교회 안에 존재하는 인종차별적인 태도와 편견들을 솔직히 얘기할 수 있도록 하고 인종과 빈부의 차이와 관계없이 모든 사람이 함께 예배 드릴 수 있는 성숙한 교회를 만들도록 한다. 셋째로, 어떤 인종이라도 연합감리교회 여선교회 회원이 될 수 있도록 권유하고 차별 없는 지도력 개발의 기회를 마련하도록 노력한다. We commit ourselves as individuals and as a community to follow Jesus Christ in word and in deed, and to struggle for the rights and the self-determination of every person and group of persons. 미국에서 6월 14일은 국기의 날로 지정되어 있습니다. 두번째 대륙 의회에서 1777년 6월 14일 성조기를 미국 공식 국기로 지정하고 그날을 기념하기 위해 생겨난 날입니다. 또한 이날은 미국 육군의 생일로 축하하는 날 이기도 합니다. 불과 2년 전인 1775년, 미국 전체 위원회에서 의견 일치를 통해 미국 육군이 생겨났기 때문입니다. 1916년 미국 대통령 Woodrow Wilson은 6월 14일을 국기의 날로 선포하였고 1946년 8월에는 국회에서 국기의 날을 국가적 기념일로 지정하였습니다. 국기의 날은 국가지정 공휴일은 아니지만, 대통령의 권위로 매년 그날을 기념하기로 하였습니다. 1937년 6월 14일 Pennsylvania 주에서는 주 정부 공휴일로 기념하였고, Rennerdale, New York에서는 매 6월 두 번째 주일을 국기의 날로 주 정부 공휴일로 지정하고 있습니다. 가장 역사가 깊은 국기의 날 행진은 아마도 Fairfield, Washington에서 이뤄집니다. 1909 (아니면 1910) 년에 처음 시작된 이 행진은, Fairfield에서 1918년을 제외한 해마다 지켜왔으며 지난 2010년에는 100번째 행진이 성대하게 치러졌습니다. Quincy, Massachusetts에서는 해마다 갖는 국기의 날 행진은 1952년 처음 시작되었으며, 가장 오래된 전통을 가진 행진 중 하나라고 합니다. 가장 큰 규모의 국기의 날 행진은 Troy, New York에서 있으며 평균 5만 명에 이르는 관객들이 모이곤 합니다. 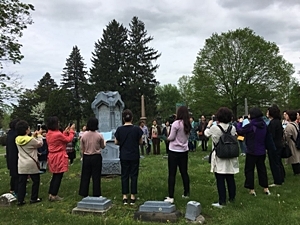 또한 매해 있는 Three Oaks, Michigan에서 있는 국기의 날 행진은 주말에 3일에 걸쳐서 펼쳐지며 가장 크고 또 가장 오래된 행진이라고 자랑합니다. 미국의 수도인 Washington, DC에서는 국기의 날을 성대히 기념하고 특히 시내에 7가 와 8가 주변에는 화려한 장식을 합니다. Clyde Thompson은 “국기의 날의 대부”로 불려집니다. 또한 이날이 지역에서 전통적으로 고기와 갖은 채소를 천천히 익힌 음식을 준비하기도 합니다. Perhaps the oldest continuing Flag Day parade is in Fairfield, Washington. Beginning in 1909 or 1910, Fairfield has held a parade every year since, apart from 1918, and celebrated the "Centennial" parade in 2010, along with some other commemorative events. Appleton, Wisconsin, claims to be the oldest National Flag Day parade in the nation, held annually since 1950. Quincy, Massachusetts, has had an annual Flag Day parade since 1952 and claims it "is the longest-running parade of its kind in the nation." The largest Flag Day parade is held annually in Troy, New York, which bases its parade on the Quincy parade and typically draws 50,000 spectators. In addition, the Three Oaks, Michigan, Flag Day Parade is held annually on the weekend of Flag Day and is a three-day event and they claim to have the largest flag day parade in the nation as well as the oldest. 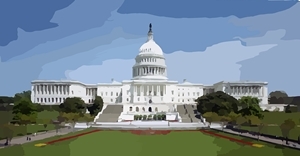 In Washington, DC, Flag Day is celebrated heavily through the 7th and 8th Wards of the city. It is said that Clyde Thompson is the "Godfather of Flag Day”. It is tradition in these wards to slow smoke various meats and vegetables. 얼마 전에 본 드라마 대사 하나가 생각난다. 행복, 누구나 다 행복하게 살고 싶어 한다. 그런데 무엇이 진정한 행복인지를 모르기 때문에 날마다 행복해지기를 원하면서도 행복하다고 느끼며 살지 못할 때가 많다. 저자 래리 크랩은 심리학자이며, 영성 훈련과 상담을 통해 그리스도인의 영적 성장을 돕는 사역을 하고 있다. C. S. 루이스에게 영향을 받았으며 이론과 실험을 바탕으로 기독교 상담을 체계화한 사람으로도 알려졌다. 저자는 상담가와 저술가로서 열심히 살던 중, 갑자기 영적인 위기를 겪은 후, 인본주의적 시각의 기독교 상담이 영적인 문제를 해결하지 못함을 깨닫고, 그는 성령을 통한 영성 상담가로 거듭났다. 이 책은 ‘하나님이 누구이시며 인간이 어떤 존재인지, 인간의 문제가 무엇이고 그것의 해답은 무엇인지‘에 관한 일곱 가지 질문을 성경에 근거해서 풀어가면서 우리의 진정한 행복에 대해서 새롭게 깨닫게 해준다. This book reminded me of a conversation from a drama I watched. A woman who received a big favor asked, “How do I repay you?” The other answered, “I want you to be happy where ever you are” Happiness, we all have desire to be happy. But, we don’t know what true happiness entails, so we go on feeling unhappy and unsatisfied. The author, Dr. Larry Crabb is a well-known psychologist who has helped many with his spiritual counseling and spiritual training. He was influenced by C. S. Lewis and is known for his Christian spiritual counseling. He lived zealously as a psychologist and a counselor when he was struck with unforeseen spiritual crisis. He realized there was no answer to be found in humanistic perspective and was reborn with the help of Holy Spirit as a Christian spiritual counselor. This book shows us how to understand the deep and perfect love we are shown by our Creator and Redeemer in a world that has short supply of true love. Dr. Crabb shows us who God is, who man is, and what are the problems of men. He solves these problems by asking 7 questions and answering them from the basis of the Bible to show us what true happiness is. He talks about how he could stay happy through his fight of his own cancer and life’s hardships. There is more to what we know and what we seek for our happiness. This book will show us how our common view of happiness is distorted. If someone asks you, “Are you happy?”, you may say “yes” to be polite. But, if you are worried, sad, empty, ask yourself if you truly know what happiness is. Are you settling for less? Do you want to be happy as Jesus was happy? If you want to learn to be happy in any circumstances, want to find what true happiness is, please take a look at this book. 7월호 기사는 8월호에 함께 실릴 예정입니다. July Web News goes out in August.